Four members of the Taillon family — Christian (left), Kirie, mom Renee and Jared — are both students and employees at Grand Canyon University. 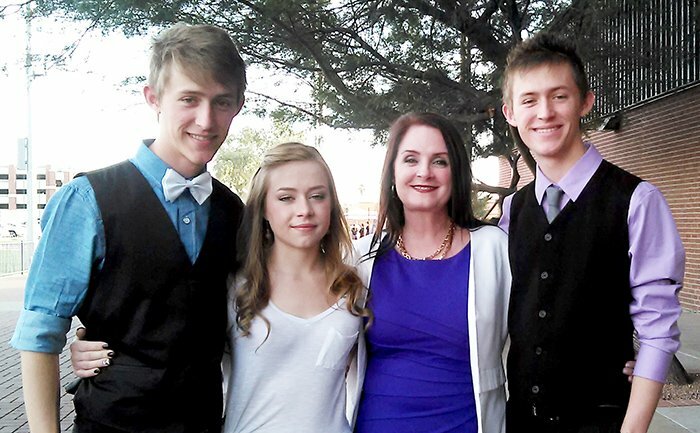 For Renee Taillon and her three children, Grand Canyon University feels like a home away from home. All four are students and employees at GCU and spend countless hours on campus. “We really do bleed purple in our family,” said Taillon, an affiliation agreement coordinator in Health Sciences who also is working toward a master’s degree in Business Analytics. Her 20-year-old son, Christian Taillon, is a junior majoring in Information Technology with an Emphasis on Cybersecurity and also is a student worker in IT Services. His twin brother, Jared Taillon, is a pre-med major working in student IT services. Renee’s daughter, Kirie Taillon, is a sophomore with plans to become a pharmacist and also is a student worker in IT services. The Taillons bring more than just family unity to GCU. Whether in class or the office, they share their faith with others on campus and believe in the University’s mission. “Our number one attraction to GCU is its Christianity. It’s what matters most,” Renee said. The Taillons’ path to GCU began in 2014 when Renee accepted a job as a university counselor in nursing. A former GCU employee who attends the same church suggested she work at GCU. “He thought it would be a perfect fit, and it is,” said Renee, who earned her undergraduate degree in Chemical Engineering from Arizona State University. At the same time, her twins, seniors at Sandra Day O’Connor High School in Phoenix, selected GCU as their first choice for college. All three were joined last year by Kirie. Yes, their father remains the odd person out. James Taillon graduated from Purdue University and works as a civil engineer in Phoenix. He is, however, a Lope through marriage and fatherhood. “Dad wears purple and is a big basketball fan,” said Christian, a commuter student who spends nearly 16 hours a day on campus attending classes, working and participating in clubs. He’s president of the Computing Club and treasurer of the Biblical Theology and Defenders clubs. For the Taillons, GCU is more than a college and workplace. The University provides them an opportunity to excel, they said, and also brings out the best in their strong work ethic and nose-to-the-grindstone study habits. All the Taillons will commute this fall semester to class and work, a drive that does nothing to diminish their sense of belonging. The Taillons have grown accustomed to others connecting the dots and discovering the family connection. Christian and Jared, fraternal twins who look alike, often get mistaken for each other. “People think it’s cool that there are so many of us at GCU,” Jared said. So what do the Taillons talk about at the dinner table? GCU, of course, but also about politics, music, theatre, relationships and plans for the future.